A full set menu prepared by Babett for ‘Gout de France / Good France’, a weeklong celebration of French cuisine. The fourth edition of “Goût de France / Good France”, a weeklong international celebration of French cuisine, starts on March 21. One of the participating venues is Babett, a trendy restaurant and bar in Yangon. The event will bring together over 3,000 restaurants around the world and 150 embassies on five continents are participating in a celebration of French gastronomy all this month. To mark the event this year, six participating restaurants in Yangon — Babett, Le Planteur, Alex’s Gastro Bar, Orng Kitchen, Le Cellier and 369 Ibis Hotel Restaurant — will feature special set menus offering a taste of France. Babett’s head chef, Christophe Buzare, has put together a five-course set menu inspired by France’s mountainous Auvergne region. “I chose this five-course set menu because those dishes are my personal favorites, and it’s very traditionally French food — and healthy food too. Foie gras terinne is a French national dish — all French people like it. I would love to serve the experience of this type of food to Myanmar people,” he said. All of the meats are imported from France. Other ingredients like strawberries, tomatoes and cabbage are sourced locally to ensure freshness. The starter, Foie Gras Terrine in Armagnac, is served with a small amount of onion marmalade and a mix of pear and dried grapes served chutney style with French bread. A menu like this with foie gras, wine and soft, pungent cheese is a rarity in Yangon but Babett will be serving it throughout March. Next comes the soup, which has a duck base mixed with cabbage and black mushrooms. It’s deliciously sweet, but leave room because there are three more dishes to come. The fish course is Sea Bass Steak with Steamed Mussels. The salty sea bass fillet is served atop a butter reduction sauce with the delectable mussels, as well as asparagus. The main — Grilled Lamb, Braised Prunes — features charcoal-grilled lamb, lightly charred and roasted slow. The aroma of charcoal is mouthwatering. Both of the main dishes were delicious and attractively arranged on the plate. For those who have the taste for it, the lamb was exquisite. Finally, the dessert waitress emerged with her wooden board, on top of which sat a small glass dish. When I removed the cover, a cloud of applewood smoke rose, releasing a tantalizing aroma. The strawberries were very fresh but not super sweet. This dessert was Warm Strawberries in Red Wine, Toasted Brioche, and Gingerbread Ice Cream. The five-course menu costs 75,000 kyats per person. With the Ossau-Iraty — a sheep’s milk cheese that is a specialty of the Basque country — it’s an extra 7,000 kyats. French-born chef Buzare has lived in Myanmar for eight years. In 2010 he worked for Le Planteur restaurant in Yangon. 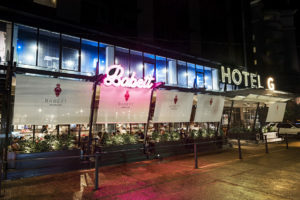 Then he moved to the Strand Hotel and finally he joined Babett Eatery & Bar. He began his culinary career as junior chef at the Plaza Athenee in Paris. After seven years he joined the Michelin-starred La Cote St. Jacques in Joigny, central France. “My favorite cuisine is French and I cook French cuisine mostly in Babett, but I love to experience other cuisines as well,” he said. The first “Goût de France / Good France” was held in 2015, following the inscription of the “French gourmet meal” on UNESCO’s intangible heritage list. Every year on March 21 participating restaurateurs from all over the world offer their customers the experience of the French way of life and showcase French cuisine made with fresh and seasonal produce.